Bard College | La Voz | Article | Are we Latinos united? The answer depends on whom you ask. I had the opportunity of finding a variety of answers and their passionate nuances in a recent meeting in Peekskill, NY. The goal of the meeting was not exactly to respond to the almost rhetorical question: Are we Latinos united? Even so, it was an interesting tangent, so interesting, in fact, that I will comment on it here, in this half month of Hispanic Heritage. But first the beginning. 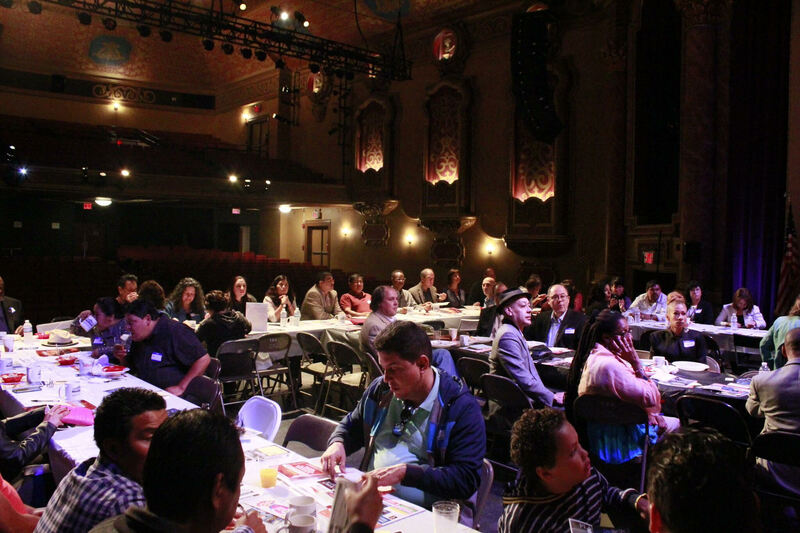 On September 23rd, around fifty Hispanic people, myself included, who work in the field of entertainment and culture, such as dancers, musicians, DJ’s, artists, merchants, local radio stations (from the Hudson Valley and Westchester) and Spanish language press (like this magazine, La Voz), met for a business breakfast at the Paramount theater of Peekskill. Community activist and artist Wilfredo Morel organized the meeting with this diverse group of people for us to tell the new director of the Paramount Theater about how Latinos can be better represented in the programming of this architectural beauty build in 1930. This was a truly laudable effort from Morel: to build bridges (and to help cross them). When the time came for each attendee to introduce theirselves and talk about their contributions, the question of Hispanic unity began to emerge. “We Latinos are not united. We are selfish. And I always ask myself: there is an Italian club, there is Portuguese club, but where is the Ecuadorian club?” complained a lady who owns a party decoration business in Westchester county. Another one, Aurelia Fernandez, resident of Yonkers, agreed with this statement and elaborated a bit more: “Why isn’t there union by all the Latino traditions, given that America is just one? Besides, our children here are no longer so Mexican.” Another person who added more fuel to this fire about disunity was Father Hilario, a Dominican of Porchester, who recounted that in his mass they play bachata, but when he organized an event called “cultural Fridays” in his church to learn from one another, only those who came from the country in question attended the event. There was, it seemed, no interest to learn about the cultural traditions from other brother Latin American countries and each remained with what it started with. Of course, not everyone agreed with this, and they voiced their opinions. Among them, Edgar Pinyol, a Mexican graphic designer, said: “I believe that there is unity, like what we have in the Comité Latino Empresarial of Peekskill, to accept other cultures.” His wife, Juana Pinyol, also a member of the CLE, agreed but added: “We are business owners in this area; we have the support of the Chamber of Commerce. They speak in Spanish in the Chamber of Commerce, but there are people who don’t show up. They say that there isn’t unity but we have had this committee for a year already.” Documentary film maker Noemí Figueroa gave a good summary: “I don’t agree with the idea that the Latino community is not united. Music is what has united us and continues to do so,” she said to general agreement. Norma Pereira-Mora, a Guatemalan artisan and Spanish teacher, encouraged everyone to put their negativity aside and focus on the positive. the outsiders will devour them”. Luckily for the organizers, the meeting on September 23rd also made progress in terms of immediate proposals for possible Latino events. I will write about this once they are more details, yet it is worth mentioning what Kurt Heitmann (owner of The Paramount) recommended the group in order to accomplish anything: if we do it together, we can do it! What do you think? Write to escribalavoz@yahoo.com and let your voice be heard!